Different kinds of land have different tenors, not just the shape and smell, but who owns the ground, what you are allowed to do on it, and where you should not be. Above the layers of geology, wooded canyons, and far-flung desert is the brushstroke of us. On reservation land, there are places outsiders should never go alone. With a Navajo archaeologist I’ve seen butte top ruins and abandoned pueblos, pottery flecked on the ground, black-painted white-fired clay, thousand-year-old art of negative spaces: a spiral, a geometric thunderhead, and long-lines of cobalt-colored pigment as if painted with a ruler. I’ve gone with permits in hand, a conversation in a hogan, or a wave to a hunter with a .22 rifle. You’ll need permission, permits from Window Rock or White River. A time or two on reservations, I had no permission, out for a walk with a pack and gear overnight, to see what I could see. Those were unwise journeys, nights fraught with paranoia. I learned it is best to seek permission. Asking forgiveness from people with bloodlines and languages going back thousands of years in a place is not easier than seeking permission. Recently I crossed a stretch of Ute land in a car, followed by a couple Suburbans filled with my students from a course on writing and responding to landscape. Many were from far away, a girl from Melbourne, an East-Indian woman from London, another East-Indian woman from Chicago, a guy with cameras freshly moved out here from the Midwest. The road was dirt, climbing toward Bears Ears in Utah, the stretch of Ute land a cherry stem. A few Native guys were pulled over with a couple pickups and chain saws, getting that good, hard piñon wood and clean-burning juniper, the ground around them hairy with juniper hides. Their trucks were half loaded, day half done. Within half a mile we were back on county land, public more or less. You are allowed to drive through the reservation, I said. Those woodcutters aren’t concerned with us. If you get to a closed gate, however, that’s where you ought not pass. Private land is not my favorite category, though I’ve been glad to own my own chunks of land where I could live and raise my children. It crashes against the Rockies like a tsunami from the east, private land gathering on the plains. Trespassing signs are ducked under in a steep draw, or crossed catching the crotch of your pants on a barb. Best not to, though. Like reservation land, you want permission. I came around a canyon bend in the forks of the Gila and a man emerged from his ranch house with a rifle, a weapon that he set down as soon as he saw it was us. We knew the combination lock to get in. If we’d been unknown, a pack of strangers hauling camping gear on our backs across his land, we would have met the end of the rifle. I was out with my gal tracking dirt roads in the West End, the far side of Montrose County. When the turn came up that would take us into canyons feathering down from the east side of the La Sal Mountains, it was gate and chains and no trespassing signs. She kept saying, you can’t do that, you can’t do that. I said yes, you can. It’s an issue around here, private land blocking off roads to public lands, a fight that never ends. 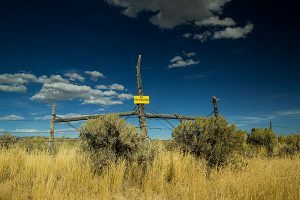 She and I had run into this before, driving a rough dirt road around the flanks of Lone Cone when we came to a trail of warning signs, private land ahead, and a gate closed and locked, an incremental parcel not letting us get back to the dirt road from Norwood to Dolores. She grew up out East, and when she came here at 26 she was flabbergasted by the scale of the land, its starkness, everything few and far between. Like me, she became spoiled on the unfettered access out here, annoyed at the thought of a padlock, that anyone could own this land, or at least the way into it. When we moved in together, she came with 36-inch bolt cutters. Public lands are my heart’s desire. Though I defer to reservations and puzzle over private inholdings, the vast, open spaces make us what we are. If we hardly enter them, if we see them out windshields and do not get off the highway onto their mazes of dirt roads and line-dotted trails, we still know they are there. We feel them. Stand in the middle of Telluride at night when all is quiet, and the weight you sense, the silence deeper than silence, is the mountains rising around you, mountains owned by no one. Public lands give the West a sky you can walk beneath. These places are kept out of private hands, owned by all the people, in practice as sticky as it sounds. In theory, and in fact, this side of North America is one of the rarest things in the world: land not eaten up and blocked off by private parties. While human populations spread and seethe, this may be the greatest resource we are left with: places that belong to themselves. 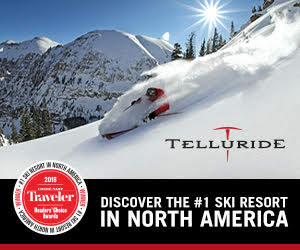 For however messy it is, waving back and forth to the whims of presidents and money tunnels of lobbyists, fought over for energy needs and water demands and ski resorts, this side of the country has remained powerful and precious because it is mostly untrammeled. Parks, monuments, BLM, Forest Service, and arrays of wildlife refuges and county properties ensure a future we’d otherwise devour. I was out with one of my kids backpacking across a stretch of the Uncompahgre Plateau when we came to a fence. The way we often travel together, we don’t carry maps or follow trails. We feel our way along, half lost, half found. This way of moving is not disorienting, but more oriented than you might ever feel. For directions, we watched shadows and the growth of moss down slopes. That morning we’d come into a number of cabins and decrepit campers up on blocks. We’d hit an old subdivision. No one was home, two tracks grown over. It felt like the publicness of the land around it was closing back in, porches and driveways moldering back to the ground. This is why I cringe when legislators and lobbyists chant about privatizing our public lands. There should be more, not less. The motivations and promises of private land owners will change over decades and centuries. We will lose the true wealth of these places. Though we drill and dig and crowd parts of public lands with cows, rafts, four-wheelers, climbers, and backpackers crabbing around their little stoves, they remain places of choice. When my son and I reached the fence and climbed over, we found no-trespassing signs on the other side. Where we’d slept last night, where we’d gathered water and listened to a bull elk cracking through the underbrush above our camp, had been someone’s property. Jumping to the other side, touching down on Forest Service land, felt like coming home. We brushed off the fence and kept walking into the wilderness, happily vanishing into veils of land.